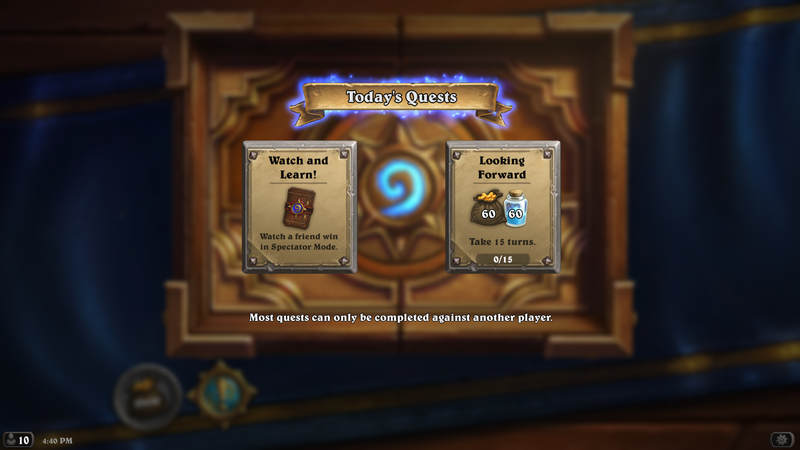 So, what are the new quests, guys? No datamining? Should I reroll a 60 gold\arcane dust one? Or should I do it? I have seen a 100 gold-dust one? Are they plenty or not? Are there 50 gold-dust ones? 60 is lowest. Reroll them. You can get 60- 80- 100- gold/dust quests. 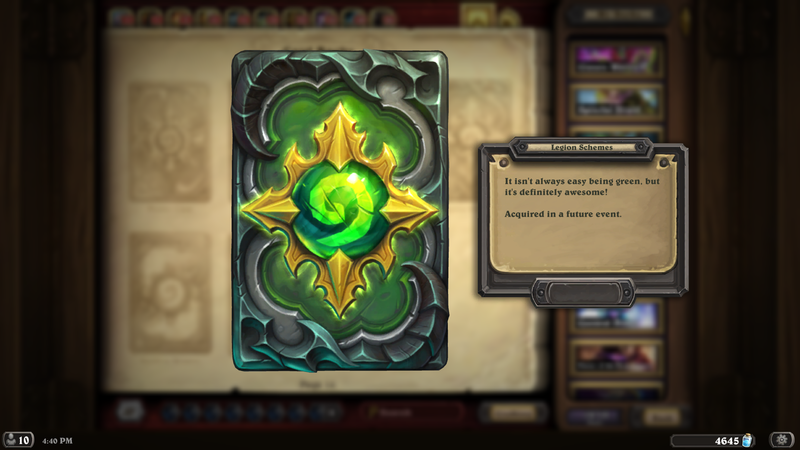 Hmm...could these 3 other card backs that have the flavor "Acquired in a future event" hints the upcoming 3 expansions? The first is Pristine Scenes, The word "Pristine" is used in WoW for items that have quest in them, and those items are rewarded when you solve the artifacts from the archaeologist findings (if I recall...). Basically it will be an expansion about artifacts maybe but more leaning to LOE and K&C type of expansion, but where could it be set at? Maybe in Pandaria since that mechanic started out there. 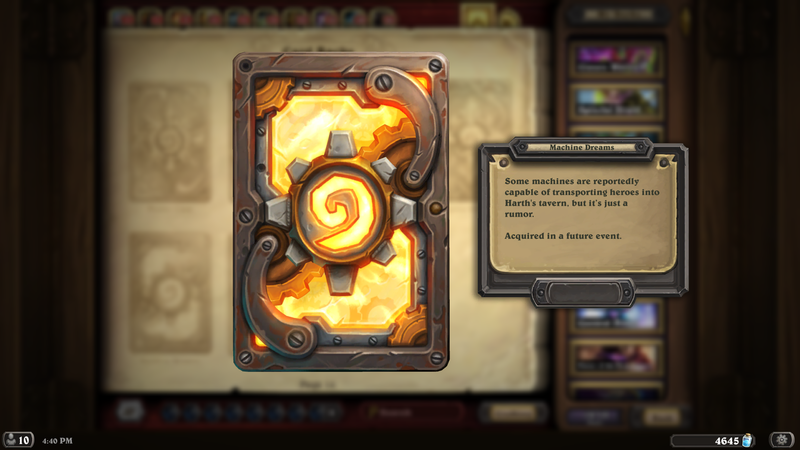 The third card back called: Machine Dreams, dunno what this could be, but it has machine in its name so maybe mechs return to support Boomsday Project's Mechs? But the flavor does talk about machines transport heroes so maybe it could be around that but its really hard to guess It. I guess I'm late typing this since this post was made way long ago but hopefully someone sees this and spread it all over the internet so others know this very detail. Probably just event card backs. I doubt they hint or have anything to do with future expansions. I just got Machine Dreams cardback and the text said it was for logging into the client on PC. 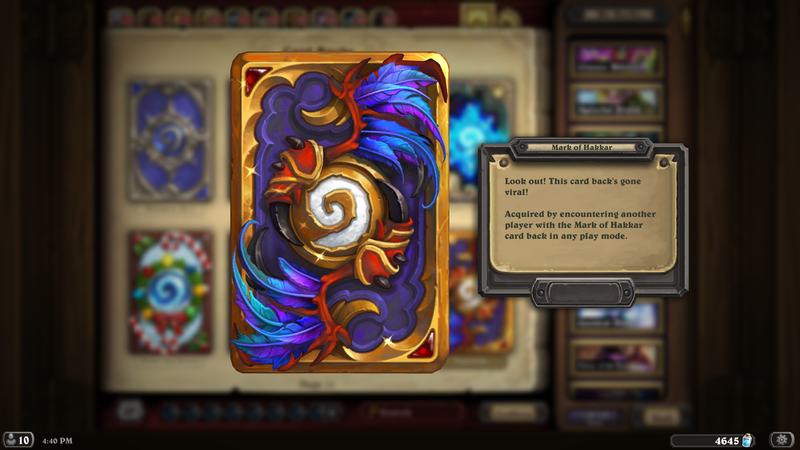 New cardbacks for special events are all so sick! I want them! Does anyone know when the special quests will be over? February 13 is the last day of the event. EDIT: Actually, i was wrong, because it was only supposed to last until February 12. But we just got a confirmation from a Blizzard employee on reddit that it's gonna last 1 day longer, because of the delays. Guess i was right all along, lol. 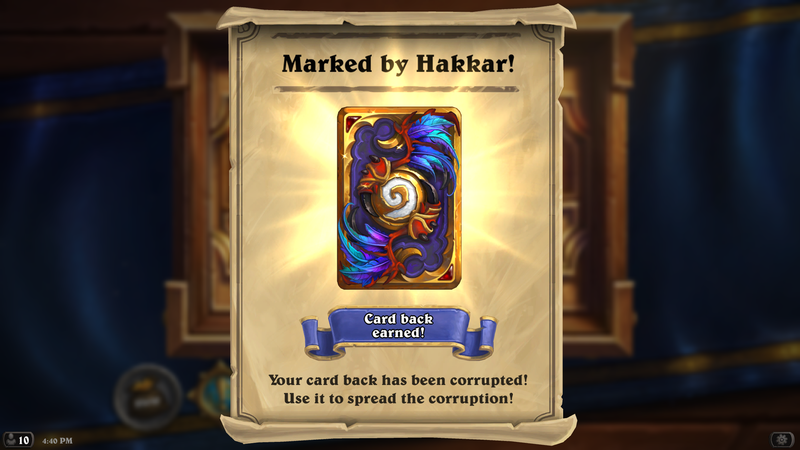 When you play a game against someone who doesn't have the cardback, does it immediatly change their cardback to the Hakkar one or does it happen after the game is done? I got my cardback first game, didn't even notice my opponent playing that cardback untill the game ended and since every single game i noticed my opponent having the cardback to. So now i'm curious if everybody already seems to have it or because this happens at the start of the game. What happened to the data mining? Just asking for updates, no rush intended. FWiW - I noticed the original news no longer mentions that there will be an update with Data Mined information. There may be nothing new...? "February 13 through March 3..."
I feel you man, I misread that as well! 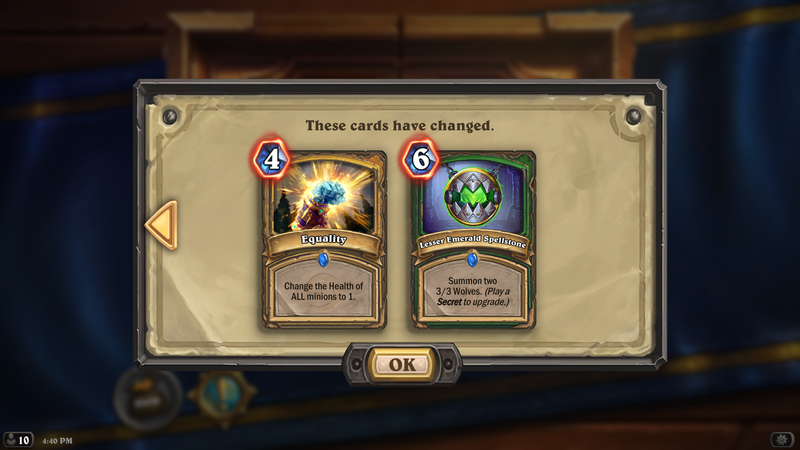 Is this curse card back bs going to last forever or only for the time of Lunar event? I prefer my festive cardback and don't want it to be changed to this one everytime I meet someone with it. You guys forgot to nerf Priest, it's absolutely disgusting to play against right now. 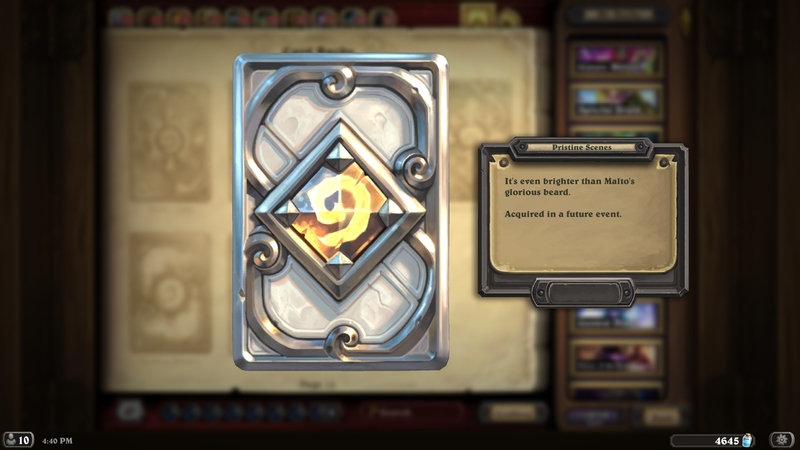 I am not big on card backs because Hearthstone positions decks so badly, that you can never really fully see your card back. But damn, this one is beautiful. 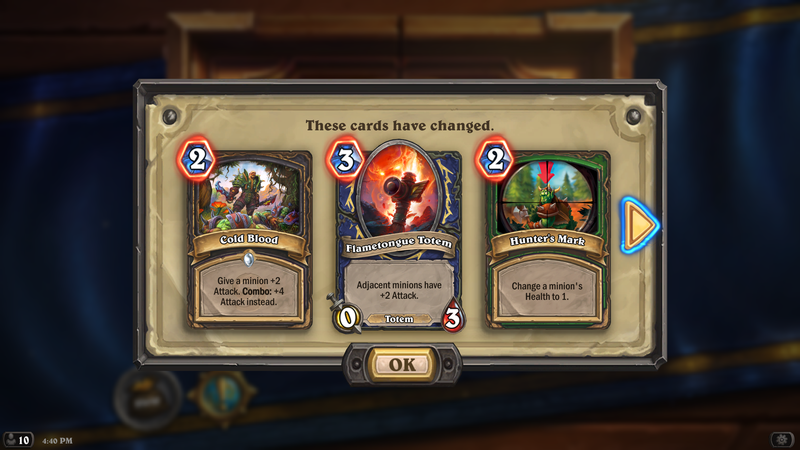 At first I did not know how the new card back (curse) worked. I played someone that had the new card back and I had never seen it before, I was thinking well this is going to be a loss for sure. I ended out winning and got the new card back (but when I started my next match I was thinking what the heck, what happened to my regular old cardback), now instead of scooping I am spreading that s - word. The other card backs for future events look really good.